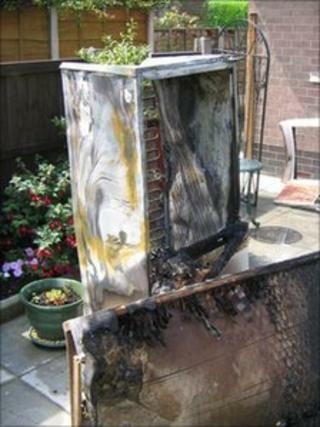 Some faulty Beko fridge-freezers began catching fire as long ago as 2007, the BBC has learned. Nevertheless most consumers were only warned this week that some of their appliances were potentially lethal. The Fire Brigade said 15 people had been injured, and one person had died, as a result of fires in London alone. Beko said it deeply regretted the incidents, and was doing all it could to address the issues, contacting 11,000 customers so far. More than 500,000 potentially dangerous fridge-freezers have been sold in the UK, and Beko is in the process of writing to its customers to arrange modifications. At fault in some models is a defrost timer switch which can become waterlogged and then overheat. The fires have not been limited to London, as similar incidents have occurred across the country, in Devon, Surrey, Northamptonshire, Oxford and Cheshire, the BBC has learned. Edel Mooney, from Oxford, said she was lucky that the fire in their house happened during the day. "Thank God we were not in bed. If it had happened in the night, we would not have been here to tell the tale," she said. Several victims have told the BBC about dramatic escapes. Adrian Horne, from Sidmouth in Devon, said his property was gutted by a fire in April this year. "My son phoned us in a panic because the front room was on fire. He had to be rescued by neighbours." Lorraine Arthur-Worsop, from Surrey, is still living in temporary accommodation after a fire caused by a Beko fridge-freezer in January saw her family lose most of its personal possessions. Michelle Woolwich, from Crewe, believes her then three-year-old son, Nathaniel, had a narrow escape. He was playing in front of the fridge-freezer, shortly before his great-grandparents took him out for a walk. Ten minutes after they left for the walk, the fridge burst into flames. This fire happened in July 2007 and Ms Woolwich is angry that it has taken four years, and one death, for the problem to be made public. Indeed the London Fire Brigade warned Beko officially about the issue in June 2010. "They were warned last year, and it's taken them still another year to give a statement for people to get their fridges checked out," said Ms Woolwich. "That seems like an awfully long time for me. That's more time that somebody else could have been killed by one of these fires," she said. And Ms Arthur-Worsop said: "We were very upset when we learned the fire was caused by a fridge-freezer but not as upset as we were to learn that Beko already knew about the problem." Beko, based in Watford, says most of the 500,000 fridge-freezers have been safely in use for over 10 years and that the affected models were made between 2000 and 2006. The company was not available to be interviewed, but in a statement it explained the apparent delay in telling customers. It said it had been co-operating with the London Fire Brigade ever since it was told about the problem in June 2010. "Over the following months we worked with them [the fire brigade] to identify the root causes of the fires," the firm said. After taking advice from Trading Standards, Beko decided to write to consumers directly. "We took all the steps necessary to ensure we had replacement parts in stock, a call centre in place, and a repair network ready to modify products. "Our plan was for a phased approach, to minimise consumer delay." But the company admitted it was not until April that it placed a safety notice on its website and many consumers only heard about the problems this week. To date 11,000 customers have been contacted directly by the company. Beko says the risk to consumers is extremely low and it is advising customers with the affected fridges to continue using them unless they notice anything unusual. After many customers experienced difficulty with the company website this week, it has taken on extra capacity in its call centre and more staff to handle emails. It says consumers can now go to the Beko website to see if they have an affected product. The serial numbers involved begin 00, 01, 02, 03, 04, 05 or 06, reflecting the years the appliances were manufactured. If necessary, the company will then arrange for the faulty part to be modified, a process which takes about half an hour. But the issue of the company's response to the fires is likely to be raised again, when a coroner hears the details of how a man died in London, following a fire caused by a Beko fridge-freezer.